Microsoft's Cloud chief, Satya Nadella, will lead the company as its next chief executive, according to a report from Bloomberg. Microsoft's board is "preparing to name" Nadella chief executive, Bloomberg reported on Thursday afternoon (US time). Nadella, whose official title is executive vice-president of Microsoft's Cloud and Enterprise group, had been one of the front-runners in the race to replace current chief executive Steve Ballmer, who said last August that he planned to step down within a year. But the board is also considering replacing Bill Gates as chairman of the company, Bloomberg reported, ousting the company's co-founder and possibly replacing him with John Thompson, Microsoft's lead independent director. If Gates is to go, as PCWorld suggested last year, it would remove two of Microsoft's iconic employees from the software giant. The problem with replacing Ballmer or Gates, is that no one executive at Microsoft has traversed the range of the company's products, which include consumer businesses like the Xbox, cloud services such as Azure, the company's Windows business, server and development services like Visual Studio, and an emerging mobile business, too. Nadella, 44, is an Indian-born engineer with degrees in electronics, computer science (from the University of Wisconsin--Milwaukee), and business administration (from the University of Chicago). 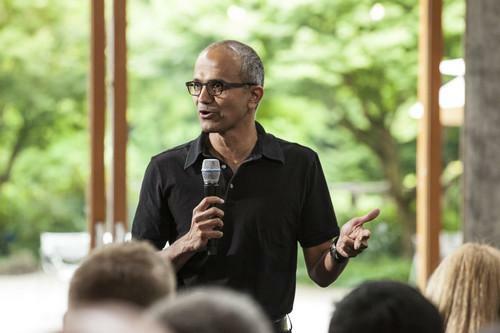 Nadella has worked since 1992 at Microsoft, and is credited with launching BizTalk, Microsoft's Commerce Server, and Microsoft's Office Small Business products. However, Nadella is most famous for having overseen Microsoft's online initiatives, where he transformed Windows Live Search into Bing. The market share for Microsoft's search offering stands at 18.2 percent, according to Microsoft's recent earnings. One problem that naysayers point to: Nadella has no experience as a chief executive, unlike internal rivals like Tony Bates, who ran Skype, and external candidates like Alan Mulally of Ford, who took himself out of the running in early January, saying he was committed to Ford. So far, Ballmer's commitment has been to a "devices and services" strategy. If Nadella is named CEO, its unclear whether he'd commit to that direction. On the other hand, his track record indicates that he can fulfill at least one half of that strategy.